Pongal is one of the most important festivals for Tamilians all over the world. It is basically a harvest festival being celebrated in the Dravidian clan for ages. It is one of the few Hindu festivals which is decided according to the solar calendar and celebrated on a fixed date i.e. the fourteenth of January every year. Scientifically, Pongal marks the transitions of the Sun in the northern hemisphere making the days longer and warmer in this hemisphere. It also marks the end of winter and marks the arrival of a new harvest season. It is celebrated for four days in all the Tamil families all around the world. On this occasion, Tamilians all over the world engage in feasting, people sing and dance on this occasion to express their elation and a beginning of the phase of prosperity and riches. 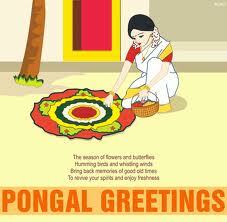 The preparation of Pongal festival is very elaborate and starts days before the actual festival arrives. In Tamil Nadu, it is one of the most awaited days of the year. On this occasion, people all over the state engage in merry making and joyous celebrations. It is the festival when people do not wait for the day of celebration to begin the decorations of their home; rather whitewashing and painting begin months before the festival arrives. As the Pongal comes closer, all the dirt, filth and unwanted materials of the home are thrown out and burnt in he bonfire. Preparations for deciding rangoli pattern also begin much before Pongal arrives. While preparing for the arrival of Pongal, the houses and courtyards of the home are cleaned and the house is decorated with new torans made of a new string of fresh mango leaves on the entry gate of the house. New clothes are brought for all the members of the family. Also, the preparation of traditional sweets begins at home before the arrival of Pongal. People also engage in buying new furniture items, curtains, bed sheets and interior decoration pieces for the home. Last but not the least, gifts for all the near and dear ones are bought for this occasion, days before the celebrations. People also buy new cereal grains, new utensils and new stoves as it is a tradition to make food with new grains in new utensils on a new stove on the Pongal day. Even the homes of the cattles are cleaned and cattles are bathed properly as the festival arrives. Not only human beings but cattles are also included in these celebrations as they are regarded as the faithful companion of the successful harvest season. The Pongal festivities begin from the day of Bhogi Pongal which is basically an extension of the cleaning and decoration procedure and gain climax at the second day, the Surya Pongal which is the actual day for festivities.